Made of highly pure resin, so your final product retains the quality you expect. Quality tested to help ensure consistency and avoid system down time. Made of highly pure resin, so your final product retains the quality you expect. PLA printed objects offer sharp corners and edges along with a glossy look and feel. Quality tested to help ensure consistency and avoid system down time. Long-duration testing uses a large 3D model (18 - 24 hours of print time) to ensure a consistent print job. Every filament color is tested at both high (100 micron) and medium (200 micron) layer resolutions on all MakerBot Replicator 3D Printers to verify that the filament will perform every feature that MakerBot apps offer and will reliably slice and print all types of models. Adheres well to acrylic and to MakerBot build plate tape for easy setup. PLA filament is designed to resist warping and curling, which allows you to print without a heated build plate. Nontoxic design helps ensure user safety. The ideal build material for your MakerBot 3D Printer. MakerBot Filament is the best, most consistent filament for MakerBot 3D Printers. With tight tolerances to ensure steady flow through the extruder nozzle and the highest print quality. MakerBot Filament is now made by our American manufacturing partners. A bioplastic derived from corn. The best and most consistent filament for MakerBot Replicator 3D Printers. 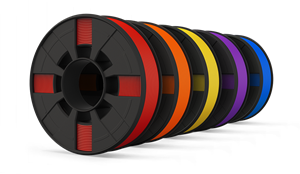 Every filament color is comprehensively quality tested at both 100-micron and 200-micron layer resolutions on the MakerBot Replicator 2 to verify that the filament will perform every feature that MakerBot Desktop software offers.